I have had some time to think about a few of the upcoming changes in Knights of the Fallen Empire (KotFE). Having considered the Core World Changes and the dreaded Level Sync, I come now to the changes in crafting. 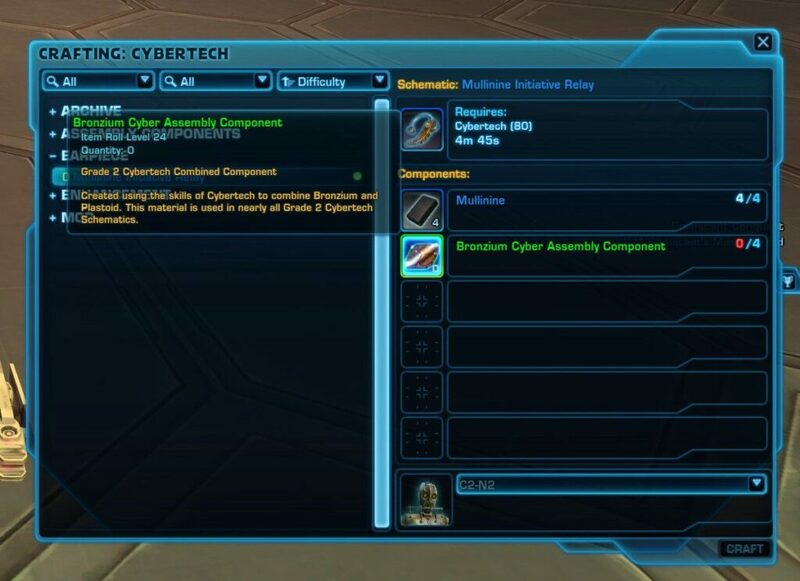 Cybertech Armourings: Cybertechs, per the official release notes, will no longer be able to craft armourings. Endurance/Resistive Armourings are now the domain of Armourmechs and Versatile/Mastery Armourings (your old primary skill) is the domain of Synthweavers. 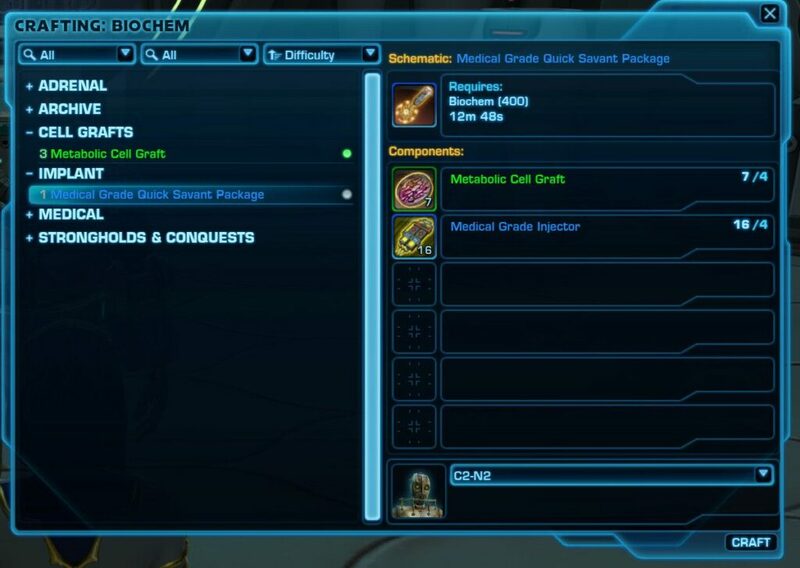 Biochem Reusable Stims and Medpacs: apparently wanting to ‘create a market’ for these items, advanced reusable stims and medpacs will no longer be craftable. This takes away some of the effort that we biochems have put in to reverse engineering our creations to obtain the schamatics. We could only share these with other biochems of an appropriate level anyway and the cost in time, credits and companion availability made obtaining them worthwhile. You eventually save credits in not having to purchase these stims or medpacs but you forewent a lot in the short-to-medium terms. That will no longer be possible. Enhancements, long the job of Artificers will be moved to Cybertechs (for whatever reason). Droid Armouring has been removed: with companions no longer being moddable, except by appearance, droid armouring becomes irrelevant. Which is a shame. I think BioWare are missing a trick here because they should create a playable Droid (as all the coding needed to create them used to be in place. My rant over no longer being able to control your companion’s skills will have to wait for another day! Update January 2016: the January Live Stream confirmed that the crafting levels would be raised to 550, and include new schematics and crafting materials. See the thread for more details. As if scavenging around planets, buying crew skills supplies, reverse engineering and sending companions off to find new schematics wasn’t complicated enough, under these crafting changes we have a new component to make. Nearly all schematics require a new Premium (green) crafting material called a Component. This new Component is made by combining two existing crafting materials along with two vendor purchased materials, all of which are of the same Grade as the component. A unique Component exists for each skill and each Grade. To make things slightly more complicated, each crafting path has a different name for a component. So Biochemists have Cell Grafts, but the principle is still the same. Components can be made using normal harvesting/missions. Then different crafted schematics require a varying number of components, plus additional materials. Purple Grade: what I have discovered that with the new 60% Reverse Engineering Chance, obtaining Purple Schematics is easier. However, you are likely to need crafting materials you cannot harvest. So that means a trip to GTN. My Artificer needs Slicing parts for purple schematics. So you will need to calculate the trade-off between just buying the modification outright in GTN vs. the cost of scavenging and purchasing the required materials. Okay so let’s focus on the positives now! Updated: after a couple of comments here and on Twitter it seems I had misinterpreted BioWare’s use of the term Level Up. Apparently in WoW and other MMOs you could ‘level up’ your crafting. I had never heard this terminology before in that context and so my previous interpretation that you could earn XP with crafting was, in fact, incorrect. What it seems to mean instead is that you can increase your crafting score by crafting components only, if you choose. Apologies for the confusion and I hope my new explanation is clearer! Oh how much I appreciate this. You know the 10,000 Credits for ‘Advanced’ crafting and scavenging skills (so, for Subscribers that’s 30,000 Credits). And no epic 50,000 Credits per skill to get ‘Expert’ training. Thank goodness this useless fee has been removed! Hallelujah! Given that you can earn sufficient comms (or crystals as they will be in KotFE) to buy blue ones, this unnecessary step to craft your own items has always been annoying. But, you know, we have had no choice and couldn’t change that. Now it has been changed for us, so we can be grateful! Items no longer generate a ‘random’ item. You know, where you’re reverse engineering a Critical-driven piece and randomly get a Power piece back. Annoying. Now that won’t happen, it will be an “improved version of that item”. We are very grateful. Well, great. They often claim you have a 20% or 25% chance of success when reverse engineering a crafted item. But we all know you can reverse engineer 8 or more times before successfully obtaining a new schematic. That’s more like 12% (if we’re lucky). I’m dubious about this increased chance and will be putting it to the test! 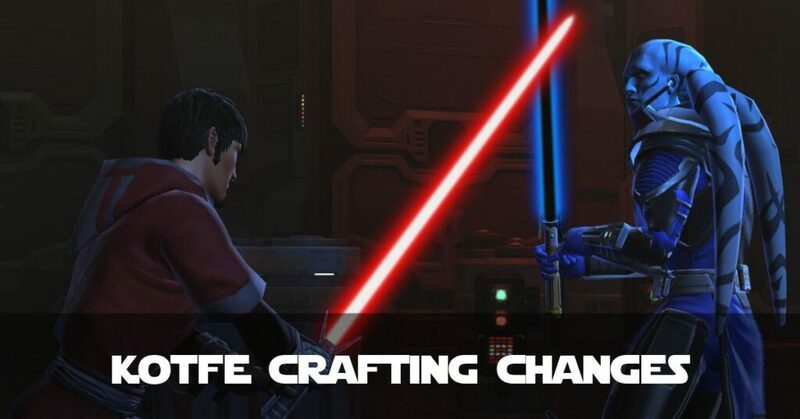 It could take ages to craft complex items pre-KotFE. They say we should see much-reduced crafting time. Which should help with the complexity, rather than coming back to your crafting a day or two later and try to remember what the heck you were building! Praise Be. You might like the look of ‘lower level’ gear and want to mod it up. Go for it. As of KotFE you’ll be able to do just that! You can get the gear from your respective trainer but you will need to reverse engineer it to get Story-level schematics. I don’t have much of a problem with this, but does seem like going back to producing ‘green mods’ which they just took out! On the plus side they say we have guaranteed reverse engineering chance. So at least no wasted credits or time. Just a formality to pass through. Bummer. I find multiplayer stuff pretty stressful which can increase my Fibro pain. So I guess my Eldergame Crafting will be pretty shocking too. Unless this ‘new material’ is not bound. And finally harvesting changes. Most of these seem pretty alright to me. We’ll be able to harvest nodes regardless of level. That helps with crafting and for re-sale on GTN. Although with more supply of these materials, expect GTN prices to be forced downwards. Just a warning on a supply-and-demand effect. Just a warning: a lot of materials are being removed from the game. So if you have any in this list – sell them to an in-game vendor for pitiful credits while you can. Better pitiful credits than a complete loss! I can’t really write a summary! You’ll just have to get your head around the changes. Some are inconvenient, some force you into multi-player but many are positive. Good luck when KotFE drops! Thanks for the great summary! I’m always too lazy to follow this sort of stuff. One question: where can I look up what materials I should sell before KOTFE hits? Heya – now worries. They are listed at the bottom of this SWTOR Post: http://www.swtor.com/info/news/blog/20151006 – hope this helps! Ah, I see the confusion. I’m 100% sure they meant you could level up your *crafting*, not your character level, by only creating the new Components. That is, you never need need to craft gear to level up your crafting, as we do now. Hiya Teo – I have just been having that exact chat on Twitter. I’ve never heard of ‘leveling up’ in the context of crafting SWTOR before. Apparently it’s a legacy from other MMOs like WoW (which I’ve never played).